Like other IT leaders, you know you have to modernize your IT infrastructure to become more productive, efficient, agile and competitive. So what's holding you back? Many organizations are still devoting anywhere from 60% to 80% of their time, energy, human resources and budget to supporting legacy systems rather than develop transformative solutions. 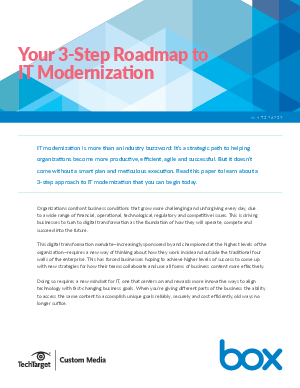 Here you'll learn the three stages of IT modernization — from realigning your infrastructure to updating business processes — so you take the right steps.